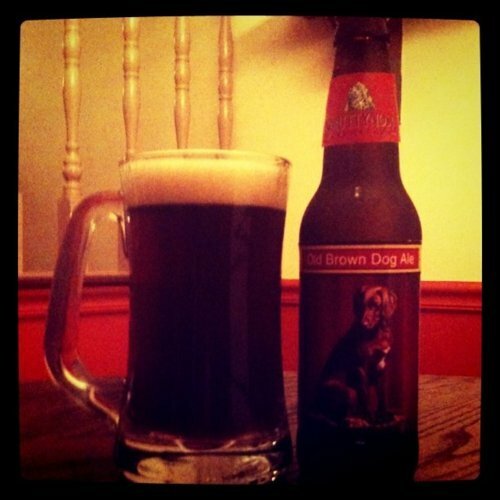 Old Brown Dog Ale is brewed by Smuttynose Brewing Company, a craft brewery located in Portsmouth, New Hampshire. The name “Smuttynose” comes from Smuttynose Island, which is the third largest of the nine islands that make up the Isles of Shoals, a rocky archipelago that is about seven miles off the coast of both New Hampshire and Maine. The company begin operations in January 1994, and this beer, Old Brown Dog Ale, was its second release. Old Brown Dog is, as you probably guessed, a brown ale. The bottle features a sassy and stately looking brown dog named Olive, whilst caps for all Smuttynose brews are emblazoned with a harbor seal. This beer company is animal friendly, indeed. Being an animal lover myself and an ardent fan of brown ale, I sampled this beverage on February 21 for review. Into the glass went an amber brew, clear in body with no particles or sediment. The head was small but attractive, forming a nice slightly tan collar over the drink, diminishing quickly. There was very little lacing to speak of, just a few bits around the top of the glass. 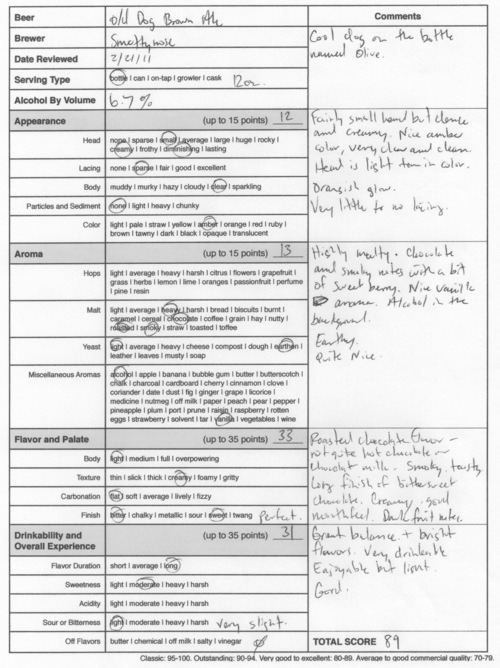 The aromatics were highly malty; smoky chocolate was featured up front with sweet berries on the back end. There was also a lovely vanilla note present, and with the 6.7% alcohol by volume (ABV) content, a medium alcohol note. The aroma overall was very earthy and sweet, typical of a brown ale, and very nice. Old Brown Dog really shines on the palate, imparting a killer dark chocolate flavor that is roasted and smoky at first and then turns creamy, thick and bittersweet, like premium chocolate cake frosting. There are hints of smoke and dark fruits, but the chocolate is overwhelmingly dominant, and it is a tasty pleasure. This is the closest I’ve ever come to drinking chocolate cake without having a sugary, cavity-causing artificially flavored liquid. This beer is quite sweet but the balance is wonderful. It’s like a huge one-two punch between the bright and delicious flavors and the balance of everything going on. This beer scored high points all around and is a wonderful example of an American Brown Ale. I think this is a drink that could be enjoyed with nearly everything from spicy food to a slice of pie — and it definitely holds up all by itself. Smuttynose Old Brown Dog Ale, 89 points. Price: $8.99 US for six pack.